Coyote Blog » Blog Archive » Want to Save The Ice in the Arctic? There's science that says that because the Earth wobbles a bit in relation to the Sun, there's symmetrical variance over time in how much light the Northern Hemisphere gets compared with the Southern. This explains regular patterns in how much ice there is at the North Pole versus the South. When one has less, the other has more. There may of course be other factors that play a role in how much ice there is at the North Pole, but I continue to be amazed at how much the pseudo-science of "Climate Studies" makes bold conclusions without fully understanding the biggest driver of them all -- the Sun! Not above the 49th parallel pal. AT least on the prairies .... the snow and the ice stay until the weather actually does warm up. Dust and aerosols are components of consensus global climate models and particularly important for predicting snow pack persistence, glacier and sea ice melting etc. Some of this is anthropogenic and some is related to dust storms in the Gobi and US SW. The relative importance of different components is best determined through accurate modeling based on real physics and real small scale data. The economic viability (or lack there of) of any potential "solution" is a separate issue. I really don't see where climate scientists would disagree with things you point out other than the fact that they continue to trust the basic physics of albedo effects after they are plugged into models (with appropriate accumulated uncertainty). That China has any interest in addressing global warming isn't clear to me. Maybe there are development grants they pursue, but aerosol/particulate reduction is going to be driven by domestic discontent and HSR and fancy renewable projects are going to be driven by ego and graft and a little economics. As far as I can tell the global tree hugging community has about as much influence on the Chinese leadership as IP and patent attorneys. I'm no expert on the albedo of open water in the Arctic, but I wonder if the effects of open water are exaggerated. At 80North and at the summer solstice the sun angle is only 33 degrees.However, at the solstice, the Arctic ice extent has decreased only from 14 million sq kilometers to 10 million on its way to the seasonal minimum of roughly 5 million in mid-September. By August 1 the sun angle is 27 degrees and by mid-September (at ice extent minimum) only 12 degrees. It seems to me that by the time there is a significant amount of open water in the high Arctic, the solar angle is so shallow that only a minimal amount of solar radiation will be absorbed and hence contribute to any warming of the sea. What a crock of crap. In the 1800s, the Northwest Passage was open to wooden sailing ships about one summer in four. Open meant that sailing ships could traverse the entire passage, which took approximately six weeks. In the past twenty years, the Northwest Passage was closed almost every summer. It has opened a few times since 2001, but only because powerful icebreaker ships forced their way through. The passage was never open for six weeks. These recent open passages would have been deemed closed passages 150 years ago. The Northwest Passage data indicates cooling throughout the 1900s and 2000s, not warming. 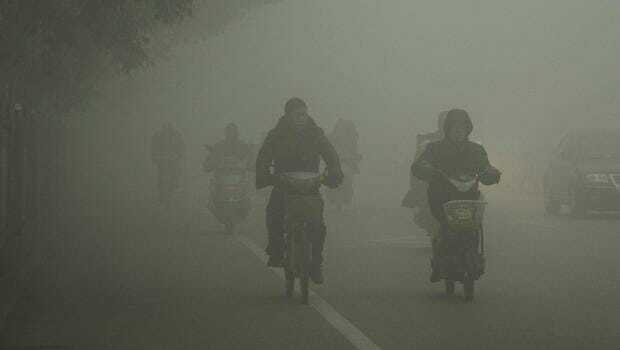 I'm sure you are aware that the smog helps protect China by interfering with the guidance systems on US missiles, therefore any effort to reduce emissions must be regarded as an attempt to leave the Chinese defenseless against US.